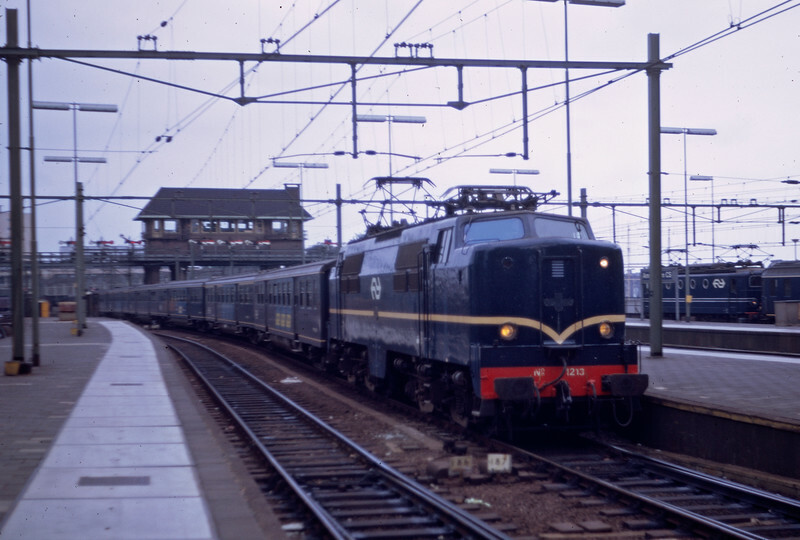 Locomotive-hauled trains were already not too common when I visited Holland as a high school graduate back in 1972. This Class 1200 unit featured a six ale (Co-Co in Europe) wheel arrangement. Built in Holland in the early 1950's, the 1200's were constructed to a Westinghouse design. Back in those days the U.S. had a different take on foreign aid, and the 1200's featured bogies and electrical systems from the U.S. that were funded as part of the Marshall Plan. The last Class 1200 was retired by NS (Nerderlandse Spoorwegen, not Norfolk Southern) in 1998. five units were subsequently acquired by a private Dutch freight operator and two reportedly remain in service today, but not #1213 seen here. I remember thinking when I saw this unit that it reminded me of the New Haven EP-5 "Jets" that I often saw during my youth. Today I imagine that loco-hauled passenger trains are close to non-existent in Holland.